Redirecting to: www.famous-trials.com/burr in (10) seconds. 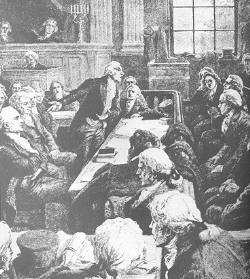 The trial of Aaron Burr. The defendant--Aaron Burr, founding father, Vice President (and slayer of Alexander Hamilton in their famous duel three years earlier); The trial judge--John Marshall, Chief Justice of the United States Supreme Court (and the most important justice in history); The force behind the prosecution-- Thomas Jefferson, author of the Declaration of Independence, President of the United States; Defense attorneys--Edmund Randolph and Luther Martin, both delegates to the Constitutional Convention and among the most prominent men of the day; Prosecutors-- Charles Lee, former Attorney General, and William Wirt, future presidential candidate.